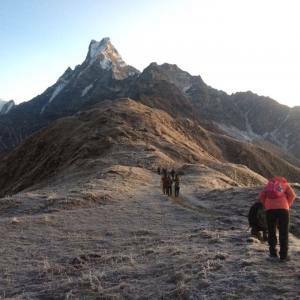 Nar Phu Valley with Annapurna Circuit Trek offers you a unique insight of the ancient valleys that still love the way they are with the highest Himalayas pass- Thorong La. 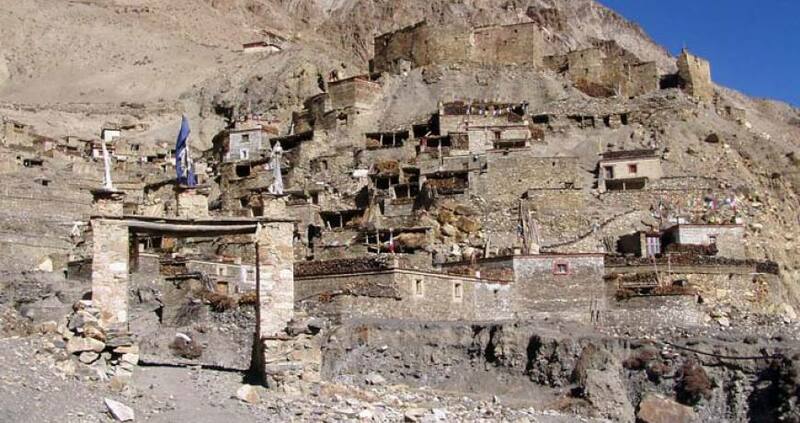 Nar Phu valley is a part of the nomadic lifestyle that has not been modified with the technology. This is a trek combined with the astonishing mountain views of the Annapurna region and the Tibetan Buddhist cultural affluence. As Nar Phu Valley lies in the restricted region of Nepal, a special trekking permit is required for the trip. Trek to Nar Phu Valley and Annapurna Circuit kicks off from the lower Annapurna region, mostly from Chamje or Manang. It can be also begin from Besisahar, but the road extension has made it possible to begin from the upper parts. The exclusive sights of the snowy peaks during the trek is magical. The restricted region of the Nar Phu Valley begins from Koto. Passing through the least explored region of Nar and Phu villages, you can picturize a different world where hospitality and innocents are still alive. While returning from the Nar Phu valley, you can cross the 5100 meters Kang La Pass to reach Manang, which is another outstanding. 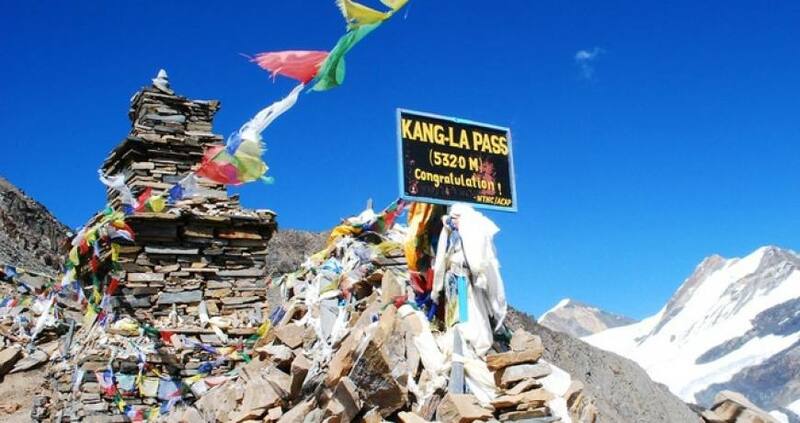 Joining the Annapurna circuit trek, it is an adventurous section, heading all the way to 5416 meters Thorong LA Pass. The Annapurna, Lamjung Himal, Gangapurna, Tilicho and the neighboring peaks dramatically allure you. Another side of the trek lies in the Mustang region, which is culturally a blessed land. Muktinath temple and the Kali Gandaki River valley are the major highlights of that part. 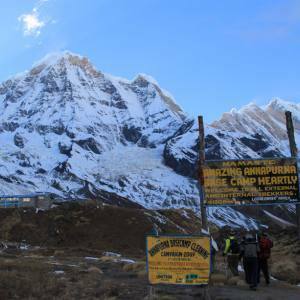 The best seasons for the Nar Phu Valley and Annapurna Circuit Trekking are March to May and September to November. The trek requires physical fitness and acclimatization. 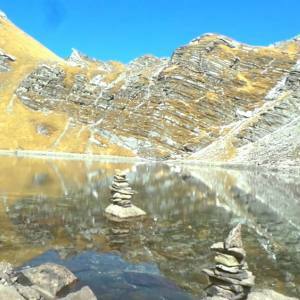 Nepal Kameleon Holidays operates this trek with the arrangement of all the paper works and experienced guide. Please, feel free to contact us for more details. Day 01: Drive from Kathmandu to Besisahar. Day 02: Besisahar to Syange by jeep and trek to Jagat. Day 03: Trek from Jagat to Dharapani. Day 04: Trek from Dharapani to Koto. Day 05: Trek from Koto to Meta. Day 06: Trek from Meta to Phu. Day 07: Trek from Phu to Naar. Day 08: Trek from Naar to Ngawal. Day 09: Trek from Ngawal to Manang. Day 11: Trek from Manang to Siri Kharka. Day 12: Trek from Siri Kharka to Tilicho Base Camp. 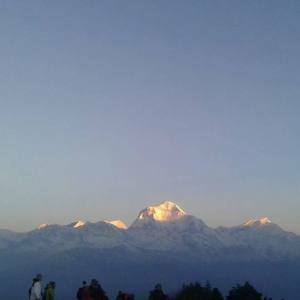 Day 13: Hike to Tilicho Lake, explore and back to Siri Kharka. Day 15: Yak Kharka to Thorong Phedi. Day 16: Thorong Phedi to Muktinath. 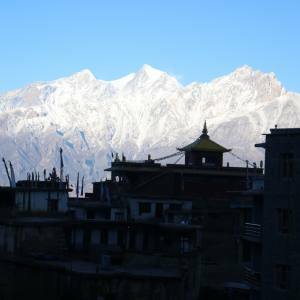 Day 17: Muktinath to Jomsom. Day 18: Fly back to Pokhara. Day 19: Drive back to Kathmandu. Hotel in Kathmandu with BB plan (Bed and Breakfast). 3 meals (breakfast, lunch and dinner) during the trekking. Lodge base accommodation during the trip. Professional trekking guide and porter, their food, accommodation and insurance. 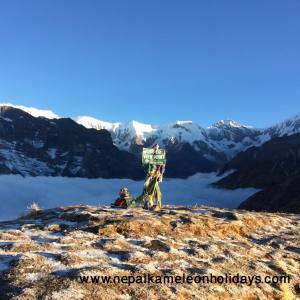 Nepal Kameleon Holidays operates this trek with the itinerary on your demand too. Please, let us know if you want to extend the trip that falls in your budget. The Tilicho Lake can be covered as a side trip. Day 01Drive from Kathmandu to Besisahar. Day 02Besisahar to Syange by jeep and trek to Jagat. Day 03Trek from Jagat to Dharapani. Day 04Trek from Dharapani to Koto. Day 05Trek from Koto to Meta. Day 06Trek from Meta to Phu. Day 07Trek from Phu to Naar. Day 08Trek from Naar to Ngawal. Day 09Trek from Ngawal to Manang. Day 11Trek from Manang to Siri Kharka. Day 12Trek from Siri Kharka to Tilicho Base Camp. Day 13Hike to Tilicho Lake, explore and back to Siri Kharka. Day 15Yak Kharka to Thorong Phedi. Day 16Thorong Phedi to Muktinath. Day 18Fly back to Pokhara. Day 19Drive back to Kathmandu. What is trekking or walking holidays? Trekking is an adventurous multi-days walk to a certain destination. In Nepal, trekking includes walking in the Himalayas and green hills. How to know if I'm fit enough to trek? Trekking requires good physical fitness. It means you should be able to walk 5-7 hours a day. If you have adverse health, it is not suitable for the altitude trek, so choose lower altitude trekking. To ensure that you can go to the high altitude, visit your doctor and get advices. How can we get acclimatized in high altitude? Well, there are several ways that you can follow. Nepal Kameleon Holidays applies some of the easiest ways for the acclimatization. Trek high sleep low is our method of trekking. Another way is to take a rest and acclimatization day and you can walk around that habituates your acclimatization level. It is the most important part. Eating foods with soup and drinking warm soups keep you warm and energized. What's about the sun protection? Sun is very direct and more powerful in the high altitude due to the cold and hot mixture. This can burn your skin and harm your eyes. So, bring sun block cream for the skin and UV ray protection glasses. What if I get altitude sickness or any injuries during trekking? High altitude sickness if often asked question. And it is in fact really necessary to know about this matter. Our guide applies first aid treatment, and if it is an emergency and do not have another way out of the medical access, helicopter evacuation is the ultimate way. But, you need to know that it is an emergency. Otherwise, trekking down or taking a rest day can be effective. Are solo female travelers safe on Himalayan excursion? We would like to let you know that Nepal is safe for female travelers and it is same of the Himalayan trekking. Our field staffs are experienced how to let the solo female travelers feel safe and trek with confidence. What should I pack for the trekking? Packings depend on the trekking you are going to do. If you are going to the alpine trekking, you need warm clothes, windproof and down jacket and other things. If you are doing lower altitude trekking, less equipment is required. Please, see our equipment checklist. What foot wears are recommended? Comfortable boots with thick sole and warm woolen socks are necessary for the trekking. If it is alpine altitude, bring more spare socks. It is easy for you to bring slippers and change at the lodge. How much a porter carry? Generally porters carry 15-20 kg baggage in the trekking. It can be more in altitude trekking. Avoid unnecessary equipments and put them in the hotel's storage or the locker. Should I tip my guide and porter? Tipping is not mandatory, but it is expected. It makes the living of guides and porters easy. We provide food and accommodation along with any transportation service on the fully inclusive trips. However, if the trip is extended on your interest or due to unavoidable situation, you need to cover the extra cost. Also, if you want to have the things not included in our cost, it is easy for you. So, bring some cash with you. What communication options can be found on the trekking route? Mobile phone connections are available in many parts of Nepal now a days. Beside this, internet wifi connections are spreading throughout the country. So, communication service is being easily accessible in most of the trekking routes. As a solo traveler, should I pay extra charges? You shouldn't pay any extra charges even though you are a solo traveler. However, the cost of solo traveling and traveling in a group certainly differ. Can I get a refund if I don't finish the trek? There are various causes of not finishing the trek. Nepal Kameleon Holidays can't refund you in this situation as it already booked the accommodation and other services. However, in some situation, the company can offer another alternative trip, but not refund. Trekking is an adventurous journey, so it needs insurance. But, if you are trekking in the lower altitude, below than 3000 meters, you do not require. Be sure about the altitude. Travel insurance helps you to be evacuated in the emergency and covering the medical cost. Where do we eat our meals? Tea house serves the meals as well. They offer extended menu with the typical Nepali food items to the continental cuisine. Where will our drinking water come from? Mineral water bottles can be bought in many parts of the trekking areas. You can drink the water from natural resources by using the purifying tablet or liquid. Is a trekking/walking holiday for me? Trekking is for you. No matter either you love adventurous or less adventurous trek, you will find your suitable trips. Should I take a guide compulsively? Can't I guide myself as a part of previous experience? The trekking trail goes through the isolated region of the countryside. It can be the wilderness of forest and grasslands. Trekking with a guide is sharing their experience and you get the energy to trek confidently. If some emergency occurs, guide will assist you. To communicate with the local people and experience their life, you need a translator, and guide is needed in every moment. Trekking is always adventurous. Everybody can go and find their suitable packages. The needed things are your interest and budget. Are there any age limits for the Himalayan trekking? No age restrictions are there for trekking. Lower altitude regions are suitable for family trips. Even children and seniors can do high altitude trekking like Everest base camp trek. There are records that even about 70 years' people are doing that. No worries about age…just be confident. What about the difficulty of trekking? Trekking is adventurous. But there are treks with easy, moderate and adventurous trips. The difficulty level depends on the specific trips. Do we need previous walking experience? Previous trekking experiences are really helpful, especially to trek in the high/alpine altitude. But, it is not mandatory. Be sure that you can do it. Should I pack hugely for my trip? Of course not. The equipment depends on the trips. Higher altitude treks require comparatively more packing and lower altitude trekkers can pack lightly. You can find the full details about it on the equipment checklist. Do I need to have insurance? Where can I obtain a policy? Travel insurance is an important part of the trekking and any other adventure activities. If you are going higher than 2700 meters, high altitude symptoms start to be seen. In the remote countryside, there are no facilitated hospitals that can care the emergency situations. Having travel insurance helps you to trek confidently and if there is required of emergency evacuation, Heli rescue is necessary. You should do insurance regarding the high altitude of your trekking destination. But if you are taking city tours or lower altitude treks, it's okay even if you do not have insurance. If you want insurance in Nepal, we can help you. What's the best time for the trekking in Nepal? The best time for the trekking in Nepal Himalayas are spring (March to May) and autumn (September to November). The weather gets cleared during these seasons. Beside this, Nepal has multiple regions that are suitable to travel in monsoon and winter too. Dolpo region and Upper Mustang region are suitable to trek in monsoon. 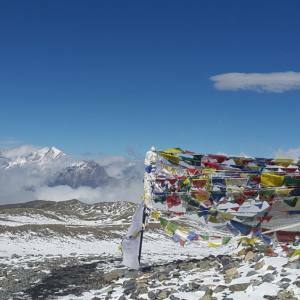 Lower altitude treks in Annapurna, Manaslu and other parts are suitable for the winter trips. Do we need to bring TIMS and permits for trekking? Generally, yes. Trekking usually goes through the National Park or Conservation Areas. To enter, you need to show the permit. TIMS card is the identity of the trekkers, which is also compulsive. If it is not a preserved area, you do not need permits. There are some restricted parts as Dolpo and Upper Mustang that require restricted area permits. What is the usual duration of the treks? Generally, trekking has got 2-4 weeks of itineraries, including arrival and departure day. High altitude treks are longer and lower altitude treks are shorter. How long should we walk each day? You need to walk 4-6 hrs each day on the trekking. But in some particular days, you need to walk for about 10 hours. For example, at the day of crossing the Thorong La Pass, at the reaching day to Everest base camp or Kalapatthar hiking day. You walk 5-15 kilometers each day, depending the trail and altitude level. What is the form of accommodations? Most of the trekking trails have basic lodges, which is also called tea houses. They are cozy and adaptable. Teahouse trekking is a lodge based trekking. It is the most common form of today's trekking that you stay in local lodges and eat there.